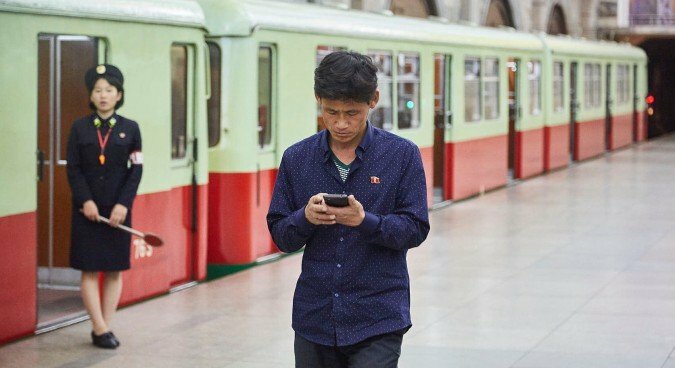 North Korean cellphone network operator Koryolink is providing subscribers with personalized ring-back tone (RBT) services, a pamphlet obtained by NK News has shown. Users of Koryolink can choose among 250 different songs, meaning incoming callers can listen to a song instead of a standard tone while waiting for the receiver to pick up the call. Subscribers can customize the ring-back tone anywhere using their phone and use the service 5-10 minutes after completing the necessary nine steps. “[Users] can join the services of setting up ring-back tone by calling 222. 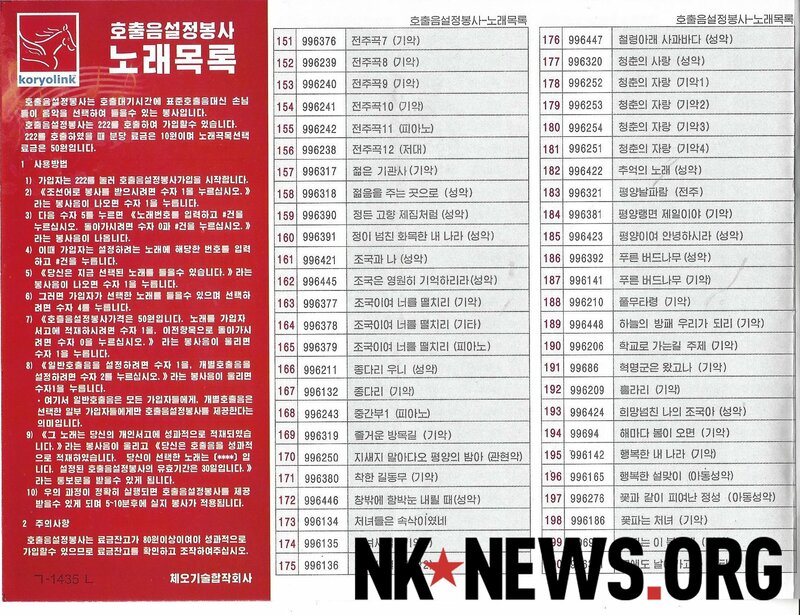 If you call 222, a [telephone] rate is 10 North Korean Won (KPW) per minute and 50 KPW (US$ 0.46) will be charged for the selection of a song,” the pamphlet reads. The official exchange rate was 108KPW to the U.S. Dollar and 115KPW to the Euro, while the unofficial exchange rate was 8600KPW to the Euro (8084KPW to the U.S. dollar) in the first week of December, a diplomat familiar with North Korean affairs told NK News. Subscribers, however, must renew the service every month. In South Korea, SK Telecom, the first to develop ring-back tone services, offers services at 990 South Korean Won ($ 0.84) per month, and South Korean subscribers don’t have change ring-back tone every month. “Press number 1 if [a subscriber] sets up ringback sound in general, and press number 2 if setting up ringback tone individually,” according to the pamphlet. The “general” ring-back tone means all callers can listen to the song, but “individual” set up means the service user can designate specific tones for specific callers. A wide range of music is also available, including pop songs, traditional and children’s music, as well as songs praising North Korea’s historic and current leaders such as “Think of leader night and day.” The users also can purchase nature sounds and instrumental music. The advertisement also suggests foreigners can use the services, saying “If you receive the service in Chosun (North Korean) language, press number 1.” But it doesn’t specify how foreign mobile phone subscribers can change their ringback tone. A South Korean expert, however, argued that offering additional network services wasn’t a new trend in the field of North Korea’s communications business. “The demand for mobile phones has been steadily increasing since 2010 and the use of smartphones has become common,” Soyoung Seo, a research assistant at the Department of International Cooperation Research at the Korea Information Society Development Institute (KISDI), told NK News. Seo pointed out that the service diversification was a sign of the increasing competition in the country’s telecommunications, with North Korea launching rival carriers “Byol” and the “Gangsong Network” when Orascom’s exclusive rights expired in late 2012.